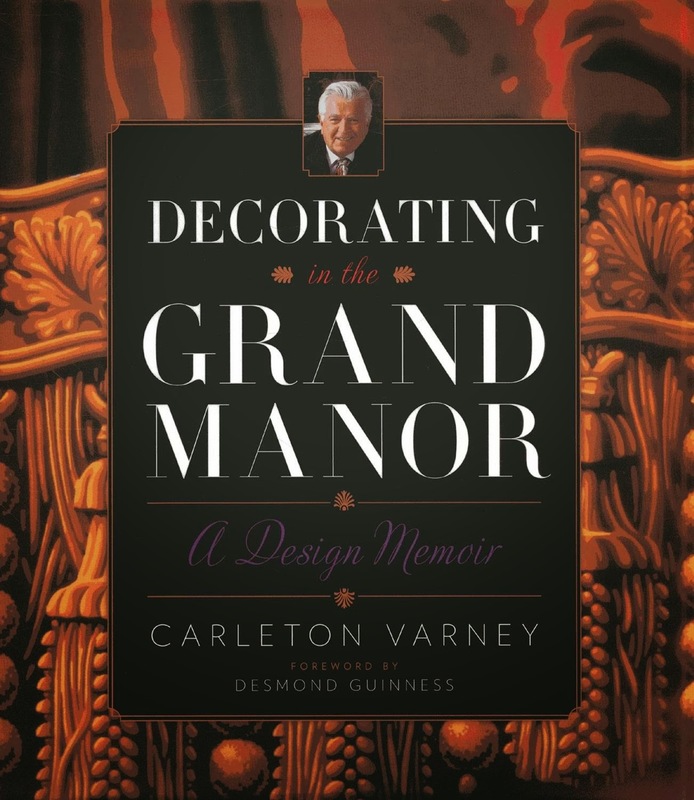 I am currently reading Carleton Varney's latest book, Decorating in the Grand Manor, and I must say that his book puts me in a very jovial mood. 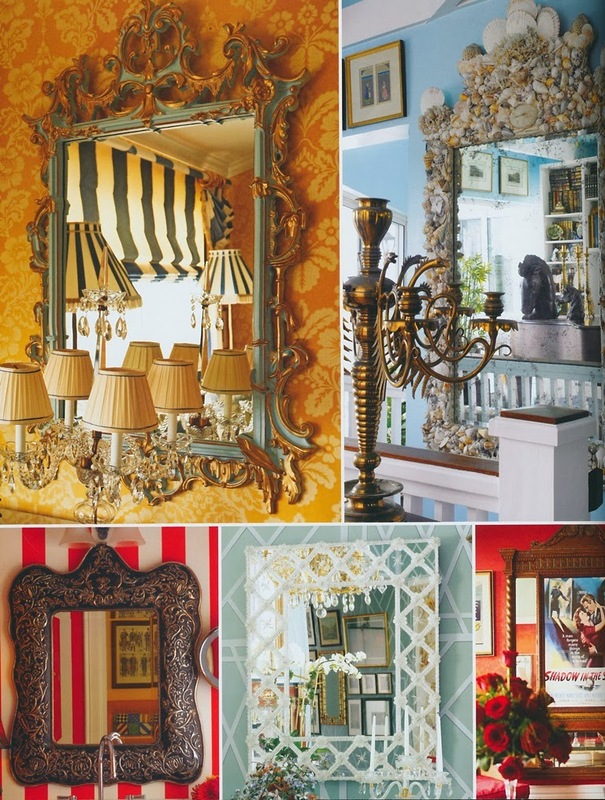 All of that color and vibrancy, which are hallmarks of Varney's style of decorating, is like a mood-lifter and pep pill rolled into one fun read. 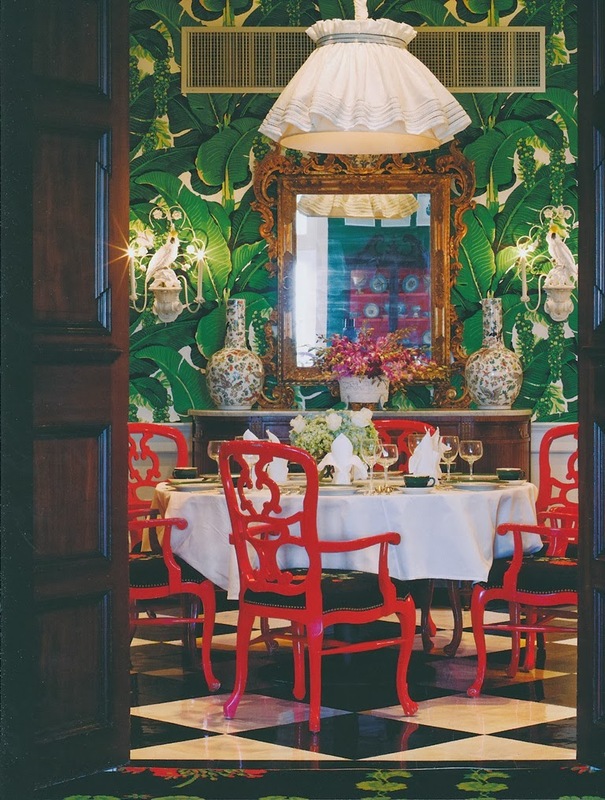 The book is touted as a design memoir, one which chronicles Varney's adventures in decorating in the grand style. That might sound a little pretentious, but it's really not. Varney explains that he doesn't use "grand" in the sense of "something big and over the top." Rather, he sees grand style as being "something different, spectacular, eye-catching- and exuding quality." At the beginning of the book, Varney shares a bit of his background, including his time spent working for the great Dorothy Draper. (Be sure to check out the photo of Draper and Salvador Dali dining together. It's a hoot.) Then it's on to a few pages devoted to his inspirations, which include Draper, Addison Mizner, Monticello, and Gone with the Wind. And scattered throughout the book are pages that feature the "Elements of Grand Style", such as mirrors, mantels, and flowers. But the heart of the book lies in the chapters that profile Varney's work at such splashy resorts as The Grand Hotel and The Greenbrier as well as in private residences. Each chapter is chock full of photos that capture Mr. Color's exuberant use of color and pattern. Even if bright color and bold prints aren't really your thing, I think you'll find the photos visually stimulating. 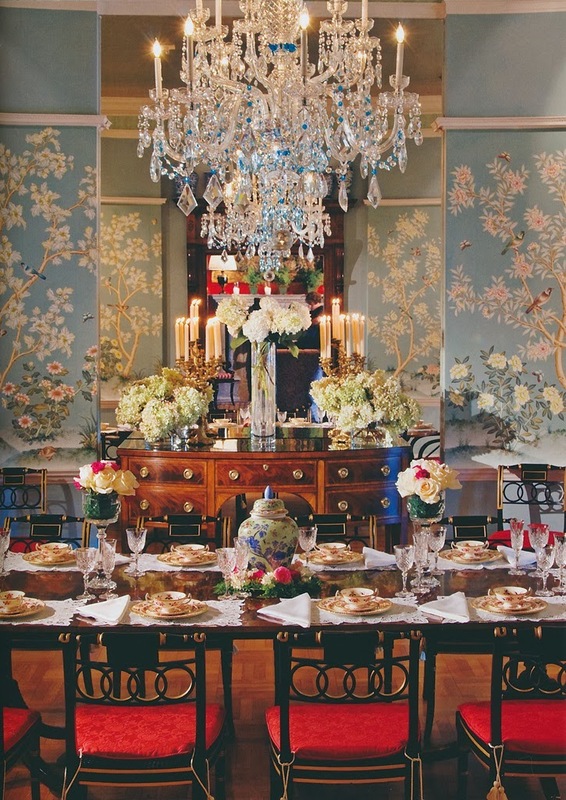 Desmond Guinness, who penned the book's foreword, called Decorating in the Grand Manor "a virtual energizer to the senses," and it really is just that. Take a look at Varney's book, and you just might find yourself rarin' to decorate. *To order a copy of Carleton Varney's latest book, please visit Amazon or Barnes & Noble. 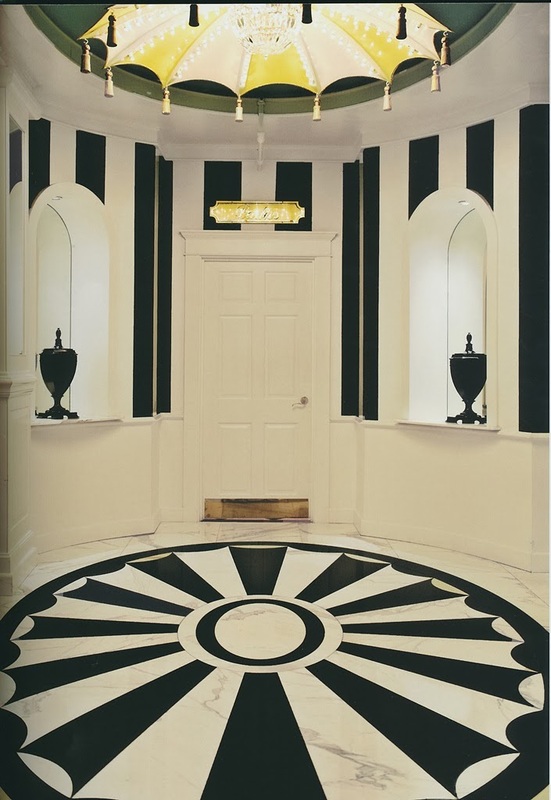 A black and white entrance to the Grand Pavilion at the Grand Hotel, Mackinac Island. 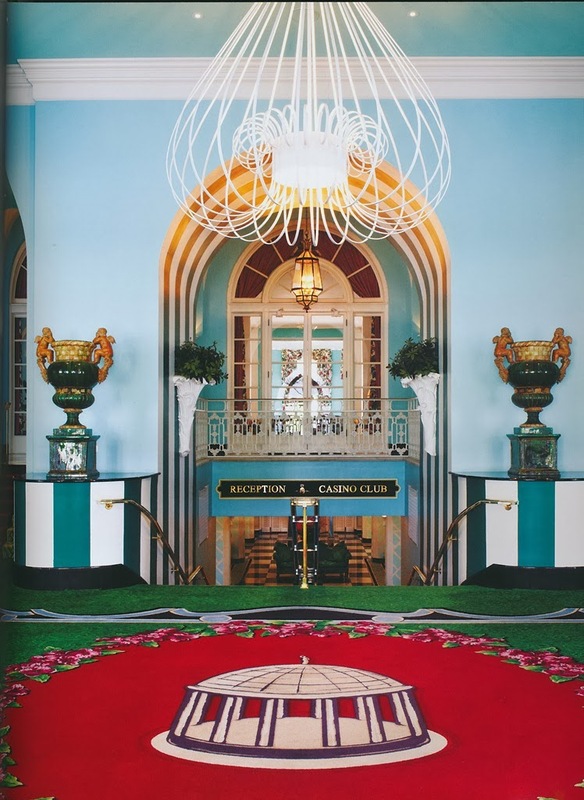 The entrance at The Greenbrier, White Sulphur Springs, West Virginia. The Penthouse at the Stoneleigh hotel in Dallas. 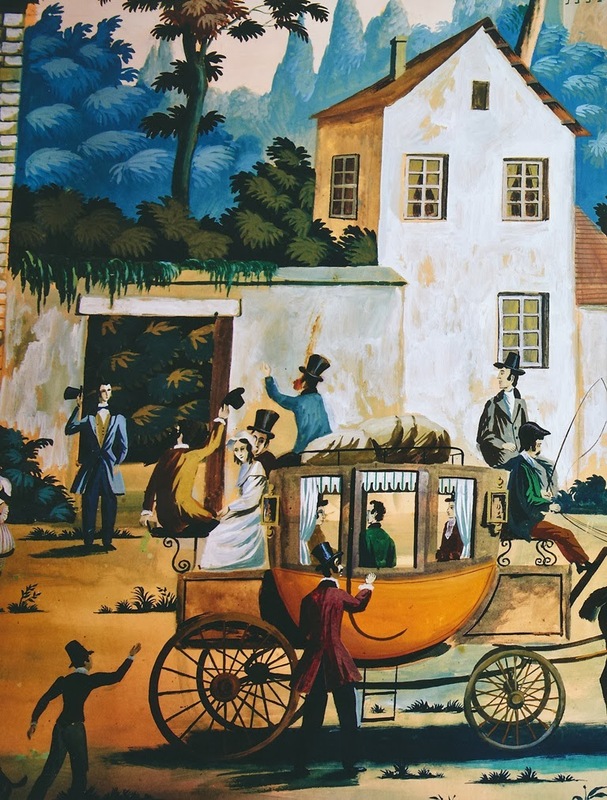 The book's endpapers feature reproductions of the charming murals in the Grand Hotel's lobby. All photos courtesy of Decorating in the Grand Manor by Carleton Varney. I love all of these rooms, but those Chinese red chairs really get my heart racing. Nice post about how grand hotel interiors used to actually be grand, or fantasy-filled, and not sterile, like so many modern ones today. That picture of the Cottage restaurant did make me nutz. Why spend all that time and money on a room, without figuring a way to handsomely disguise the ugly air vent? Is a well designed bronze grille, a slightly different shape and color from the ugly white rectangle or a treillage frieze to incorporate the vent so very hard to do? Quatorze, do you think this is a code issue? I have frequently seen these kind of vents in elegantly appointed public spaces. It makes me wonder if keeping these vents are for budgetary reasons or code reasons? Just curious! No, I have seen better designed vents. I think it is just lack of imagination and the poor coordination between trades and designers. Often, the builder installs the standard stuff and then. long after, the designer is stuck with a situation that the client will not pay for to rectify. I had a grille made of bronze for a client who had such an ugly vent in her home. Building inspector had no problem with it as long as the air flowed and it was fire-proof.